My fifth Polish course, this time in an adult evening class again. I thought hardest times would be over, being able to count to trzydzieści with a little help. Until today our nauczycielka started to teach some other minor aspects of numbers. 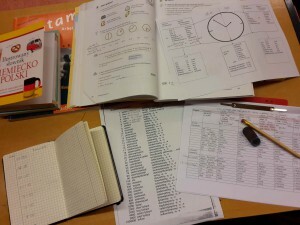 After this I thought to jump over to the parallel course of – Italian language. Ale, Polska : I will not give up. Fun has just begun :)!